Ustad Mohammad Omar (1905-1980), an Afghan rabab virtuoso, helped shape what many Afghans identify as their "national" music. While Director of the National Orchestra of Radio Afghanistan during the mid-20th century, he composed over a hundred melodies known as naghma and brought acclaim to the short-necked plucked lute, the rabab. Over the airwaves, Ustad Mohammad Omar presented a diverse collection of songs from Afghanistan's rich musical heritage. His radio orchestra, with its regional folk instruments, introduced the nation to a variety of folk traditions rooted in the country's many ethnic and linguistic groups. Born in Kabul, Mohammad Omar grew up in a family of musicians in the musicians' quarter known as kharabat. In the 1860s, Indian classical musicians were brought to Afghanistan to play at the court in Kabul. The kharabat was an old section of the city given to the imported Hindustani musicians. These transplanted musicians gained distinguished status among Afghan musicians, receiving the title of ustad. The descendants and students of these musicians continued to foster musical traditions from India and Pakistan. As a result, Indian classical became the elite art tradition of Afghanistan. At the age of ten, Mohammad Omar's father, Ustad Ibrahim, began teaching him to sing and play the sarod, rabab, and dutar—three types of lutes. Many years later, as a virtuosic rahab player, Ustad Mohammad Omar elevated the instrument from a beloved folk instrument to the level of a classical solo instrument. The dutar, a long-necked lute, became one of the standard orchestral instruments found in the national radio orchestra. But it was the rabab player who led the orchestra, playing a melodic phrase to be followed and echoed by the ensemble. The rabab is the best known of all Afghan musical instruments and holds a special place in the minds and hearts of many Afghans. It originated in the Kabul-Ghazni region and is also popular outside of Afghanistan in Kashmir and in some regions of Pakistan. Today, it is revered by Afghans all over the world as Afghanistan's "national instrument." The rabab has a deep, waisted body. The entire instrument is carved out of a single piece of mulberry wood. Its neck and upper body are hollow, covered with a thin piece of wood, and a membrane covers the lower body. It has three main playing strings tuned a fourth apart along with 12 to 15 wire sympathetic strings. The rabab is played with a wooden plectrum or pick called shahbaz. The rabab's deep, resonant sound epitomizes the Pashtun regional styles, where it is an important accompaniment to folk songs and an essential member of popular instrumental ensembles consisting of rabab, harmonium, and tabla. Until the 1980s, Radio Afghansistan hosted Ustad Mohammad Omar's National Orchestra, which consisted of regional folk instruments brought together to play regional songs and some newly composed works. The radio orchestra played an important role in Afghan music, determining the sound of Kabul and in many ways, of the nation. The orchestra transmitted traditional regional styles from the north (Mazar-i Sharif), northeast (Badakhshan), west (Herat), southeast (Logar and Jalalabad), south (Kandahar), and other districts such as the Hazarajat, Panjshir and Nuristan. Under Ustad Mohammad Omar's direction, the radio orchestra helped shape a sense of national identity. In 1974, Ustad Mohammad Omar received a Fulbright-Hays Foreign Scholar Fellowship to teach at the University of Washington. He became the first Afghan musician to teach at a major American university. On November 18, 1974, Ustad Mohammad Omar gave a public concert at the University of Washington, displaying his virtuosity on the rahab to a Western audience for the first time. The concert consisted mainly of Ustad Mohammad Omar's specialty—Afghan classical music. Most of his pieces on the rabab are structured in two parts: the shakal and the naghma. The shakal is an improvisatory introduction of a melodic mode. It is followed by the naghma, a composition in a fixed melodic mode and rhythmic cycle. Rabab improvisations of the naghma are mainly rhythmic (the melody is constant) and emphasize complex, right-hand stroking patterns. For this concert, he was accompanied by Zakir Hussain on the tabla. Zakir Hussain and Ustad Mohammad Omar met only on the morning of the show and they did not speak the same language. This proved to be no barrier to their music making; Ustad Mohammad Omar and Zakir Hussain spoke with their instruments, weaving a graceful tapestry of sound. The concert was so well received that recordings of it were bootlegged around the world for years thereafter. The 1974 concert was also memorable to Ustad Mohammad Omar, as reported by Larry Porter, a rabab student who later studied with Mohammad Omar in Kabul: "His eyes would light up whenever he talked about the concert he played with Zakir Hussain in Seattle. Apparently, he really enjoyed traveling to America and sharing his music with the people there. 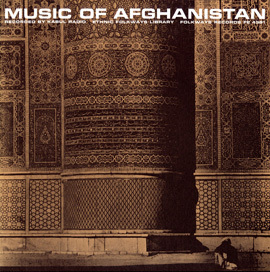 Unfortunately, as far as I know, the Seattle concert was the only time he did that... "
"At a time when Afghans are undergoing the threat of losing their cultural heritage, [...] it is hoped that recordings of Afghan music such as this one can provide inspiration and hope to a people who have undergone unimaginable loss and pain. This compact disc of the 1974 concert is dedicated to Afghanistan and all the Afghans who proudly remember and honor their music and musicians, and to all the young Afghans who are entrusted with the task of preserving and developing their musical heritage for the future." 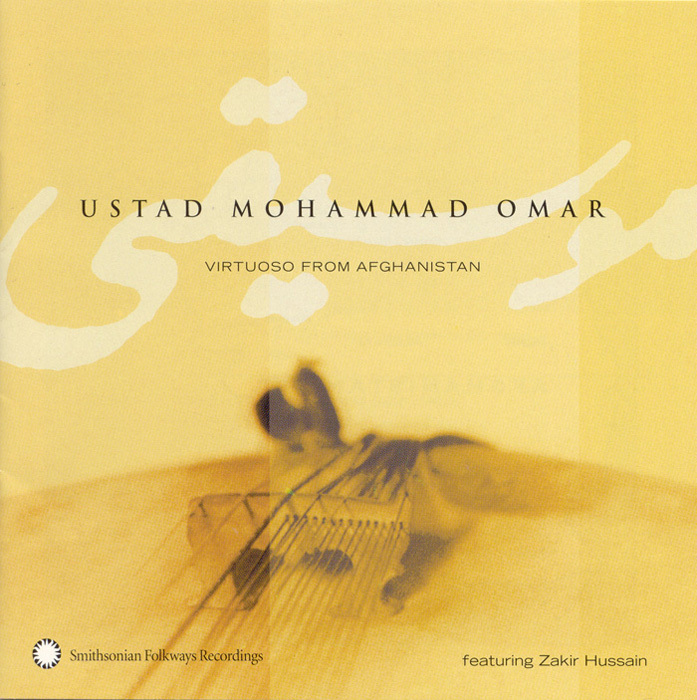 Ustad Mohammad Omar's music on this recording offers a glimpse into Afghanistan's past, endowing the present with a reminder of the nation's rich musical heritage and inspiring the future with a virtuosity never to be forgotten. Ustad Mohammad Omar, December, 1974. All photos courtesy of Robert Garfias, Anthropology, UCI.